El Capitan State Beach campground is a relatively large campground and has 142 sites for tents trailers and motorhomes (up to 42 feet). The campground also has group camping and hike/bike campsites. Campsites 125-132 are for RVs and trailers only. There are no hookups in the campground. ADA Campsites are 8, 9, 20, 26, 33, 38, 39, 40, 80, and 83. Each campsite has a table, fire ring and grill. Quiet hours are from 10 PM to 6 AM. Three vehicles and 8 people maximum are allowed per campsite. However, your reservation fee will pay for one vehicle and one towed vehicle. Facilities at the campground include flush toilets, drinking water, coin operated showers, a laundromat, RV dump station, a day use/picnic area and campfire center. Firewood is also available for sale from the campground host. El Capitan campground has lots of shady areas with many oak and sycamore trees throughout the park. Some of the campsites also offer beautiful views from the cliff-top. There is also a sandy beach with tide pools and many hiking trails. The coastline in this area boasts high cliffs, sandy beaches, rocky tide pools and lots of surf. Keep your eyes peeled and you may be lucky enough to spot majestic dolphins, elephant seals, and sea lions in the water! You also have a good chance of seeing some whales during their migration to/from Mexico. Outdoor recreation includes swimming, surf-fishing, surfing, ocean kayaking, hiking, biking, sunbathing, beach combing, picnicking and wildlife viewing. 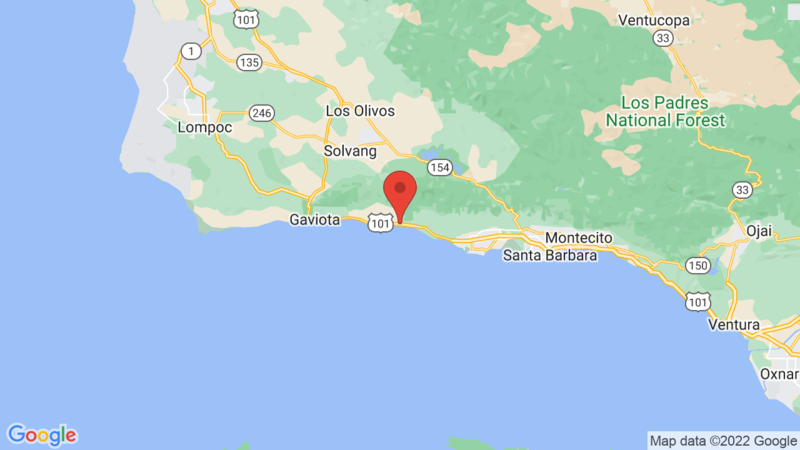 Three other campgrounds in the area include Gaviota State Park (39 campsites), Carpinteria State Beach (216 campsites) and Refugio State Beach (66 campsites). Visted El Capitan State Beach Campground lately? We'd love to hear about your adventure. Did you find us useful? Did we forget something? Anything our community should know before heading out to El Capitan State Beach? Many years ago we camped at El Capitan in a pop up trailer. It was wonderful! We drove by there last weekend and it seems campers can no longer camp under the trees! There are now cement pads to park your RV or trailer on! Has anyone camped there recently? I’m not happy about the change. At El Capitan State beach the sites in Loop One nearest the beach are still primitive sites, Loop 2 as well…i think you may be refereing to loop three and four which are the loops you see from the road, those are the group sties and have been reconstructed and revamped. THE TREES are missing in LOOP 3 and 4 Because of a large fire years ago. This is a very nice camping place although we had an access road passing by the back of our site and just a bit further over, a train track with a train passing by in the night. If, however, you are lucky enough to get a group site, you can actually sit by the cliff over the beach and really enjoy the awesome views! I think it’s a very nice place, overall. Kids went camping there a few days ago. Apparently the place has been wiped out due to a tsunami. So sad!! Rest assured that El Capitan State Beach is safe and sound. There has been no tsunami to hit California since March 11, 2011 as a result of the 9.0 magnitude earthquake off of Japan. The resulting 2011 tsunami in California was very small resulting in minor damage mostly in the Crescent City area of California. El Capitan State Beach had no damage and is open. Can anyone please tell me what is the best website I can use to make reservations to tent camp here at El Capitan State Beach? Thank you! During summer and weekends, it is difficult to get a reservation at El Capitan State Beach. ReserveCalifornia.com is the agency that handles reservations. The reservations work on a 6 month rolling window. So, for example, if your arrival date is July 1, then the first day you can try and make a reservation for a July 1 arrival is on January 1 at 8AM PST. There is also a ‘bot’ site that is grabbing reservations with its speeding computers/connections and then reselling the campsites for an additional $39 per night. ReserveCalifornia.com and the State of California Parks department are aware, but don’t seem to care. You can read more about in the comments HERE. Why can’t anyone do anything about the “bot” sites and why does’nt the SOCParks department not care? How can one get in touch with them and ask about this situation? Can you give me info on who to call? Yes, it is a bad situation with the “bot” sites snagging reservations. We ran a poll on our Facebook page earlier in the year to gauge the satisfaction with ReserveCalifornia and the response was overwhelmingly negative. There have been several comments on our ‘Tips to Reserve A Campsite‘ blog post where you’ll see what some people have done (to complain). CampsitePhotos has contacted both ReserveCalifornia and California State Parks about the situation. They have indicated they are “aware of the situation”, but so far no progress. Are there any campfire restrictions in place at this time? There are no fire restrictions at El Capitan State Beach campground at this time. That’s correct – at El Capitan State Beach campground you can have up to 3 vehicles (including the towed vehicle), but the third vehicle will cost extra (per night). CampsitePhotos.com is not affiliated with the campgrounds listed on our site. We provide the photos of each campsite, camp info and link to make reservations. With that said, there are no hookups at El Capitan State Beach. Campsites 125-132 are large (RV and trailer) sites only and your rig will fit in one of those. Many sites throughout the campground will accommodate rigs up to 42 feet. It would be best to click on the “Make A Reservation” button to check with ReserveCalifornia on sizes of all campsites. Anyone know if there is a dump station at El Capitan? If not, can you recommend one nearby? Yes there is a dump station at El Capitan State Beach. Is it in working? The last couple of years it has not been operational?Dought was also been a problem no showers. Not sure I understand your question. Is what working? Are there any spots in the lower loop 1-28 that will fit a 30 ft class A motorhome? Looks like a couple of sites will fit your 30 foot motorhome in campsites 1-28 at El Capitan State Beach. Check out sites 1, 3, 4, 7, 11 and 12. Although sites 1 and 3 may have a few tree limbs to deal with. Hi! I just made a reservation for my Cub Scout group, Pack 114. We are very excited to visit in a few months. I was hoping to get information about hikes, trails, tide pools, caves, and anything of the like. I’d so appreciate anything you can offer. Thanks so much! That is great news about getting a reservation for your Cub Scout group at El Capitan State Beach. There are some nice trails throughout the campground, and of course the beach will offer some great opportunities to explore (beach combing, tide pools, caves, etc.). You’ll find the tide pools and a few small caves close to the campground. You may also want to drive up El Capitan Canyon. There’s a parking area and trailhead at the end of the road where you can hike along the creek and through the hills. The camp ranger (at check in) should also have some brochures and ideas for you too! Have a great time! I have a couple of questions related to ADA access at El Cap. We have a 30′ class A motorhome with a wheel chair lift on the passenger side. My husband is a wheelchair user and has the disabled discount pass. Q1: What campsites would be suitable for us to camp in? How can we assure they are available (during the non reservation season) before we drive up there? Q2: What other features are available for my husband using his wheelchair? El Capitan State Beach ADA campsites are: 8, 9, 20, 26, 33, 38, 39, 40, 80, and 83. Unfortunately there really isn’t anyway of knowing if any of those sites will be occupied (during the non reservation season). You may try calling the Park directly (before you go) at: 805 968-1033. 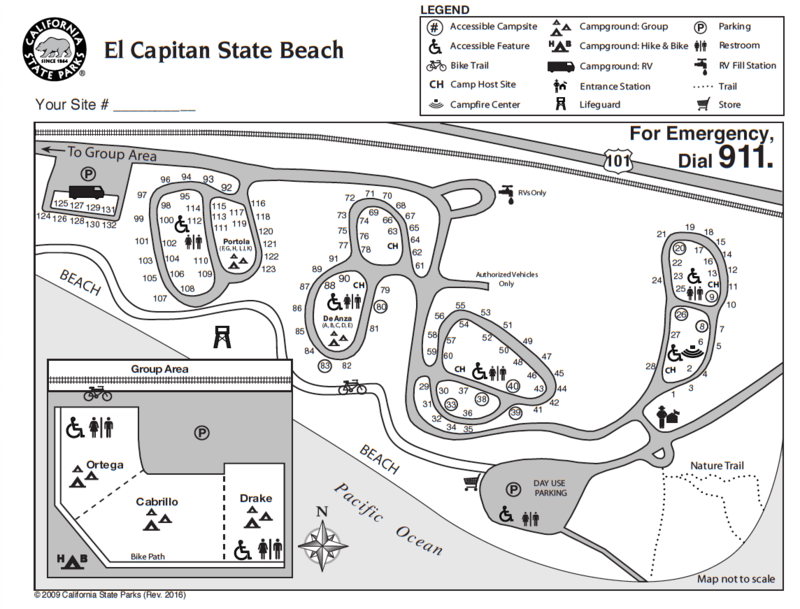 El Capitan State Beach also has ADA restrooms in the campground. The amphitheater is also ADA. Thank you. Which ADA sites will accommodate a 30’ motorhome with side wheel chair lift?